Ok so today was the last day for my Biggest Loser challenge at work. No one was there at the office to weigh me in but according to my home scale I have lost a total of 16 pounds since I started this journey the beginning of January. I was scared to take my after pictures because ....well....I personally didn't see a difference in my body. I could tell some in my legs but without measuring before I started I had no idea where I was losing. When I did finally get the guts to take my after pictures and put them next to the before pictures....I literally started to cry. I could not believe the difference!! If anyone tells you that walking doesn't make a difference, they are lying to you. I am here to tell you that I personally have lost 16 pounds so far in my journey and the majority of it was from just walking. Even if it's in place, it helps! I have also added a few other things into my workout and have started to eat healthier. In fact when I do eat something that isn't so good for me, I feel ill. I drank a soda the other day lol first one since I started and ewe. I couldn't bring myself to drink all of it and dumped it down the sink. So are you all ready for these before and afters? Now don't get me wrong I am going to continue my journey and lose more but I want you to see what I have done so far!! I am down to 160 pounds. When I started I was at 176. So here we go! Now you see why I started to cry! I am so very proud of myself right now! And if this isn't motivation for anyone I don't know what is! I have worked hard the past few weeks and it's paid off more then I ever expected! 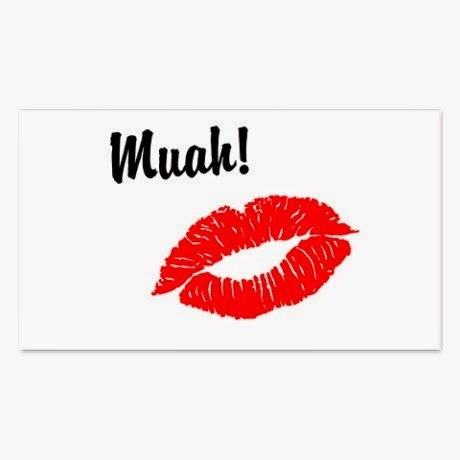 So I will leave you now till next week! Much love for all of you out there taking this journey with me! WORKS FAST: Don't be fooled by the gentle formula, Happy Eyes is super effective. While some users report a dramatic difference after just one use, most report seeing consistent results after each application. A little patience and consistent use will work wonders! HAPPY EYES was specifically developed to quickly rid DOGS & CATS of tear stains. At OmegaPet we believe every pet owner should enjoy the peace of mind that comes from naturally derived holistic products. Our pet ear cleaner and pet shampoo are among the top rated on all of Amazon. Shop with confidence backed by our 100% no risk promise on all products. 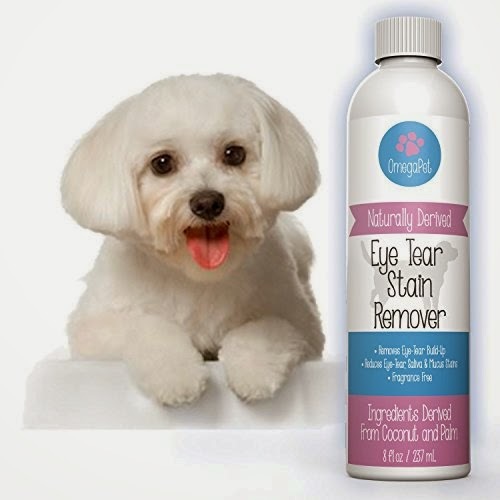 WHAT CUSTOMERS ARE SAYING: "If you own a pet suffering from terrible tear stains you NEED this, our Maltese looks amazing all the time now" - "His face looks so much clearer and cuter"...See why customers are raving about OmegaPet Eye Stain Remover! I LOVE what this does for my babies. We have three pups in our home, two of which get "sleep" in and around their eyes. Just like humans we tend to get that crusty stuff and want to wash it off as soon as possible. So why not have a great product to use for your dogs as well! I have been using this for about 2 weeks now and it is working extremely well! It's made of natural ingredients so it wont harm your babies! I recommend this to anyone who has a dog in their home! If you are interested in purchasing this product you can do so on ~AMAZON~ or go to their website ~OMEGAPETS~ and join for exclusive coupons and deals on their products!! Clinically formulated cleansing—that's how great skin starts. Dermatologist-developed Facial Soap maintains protective lipids and loosens surface flakes to leave skin clean, comfortable, and refreshed—never taut or dry. 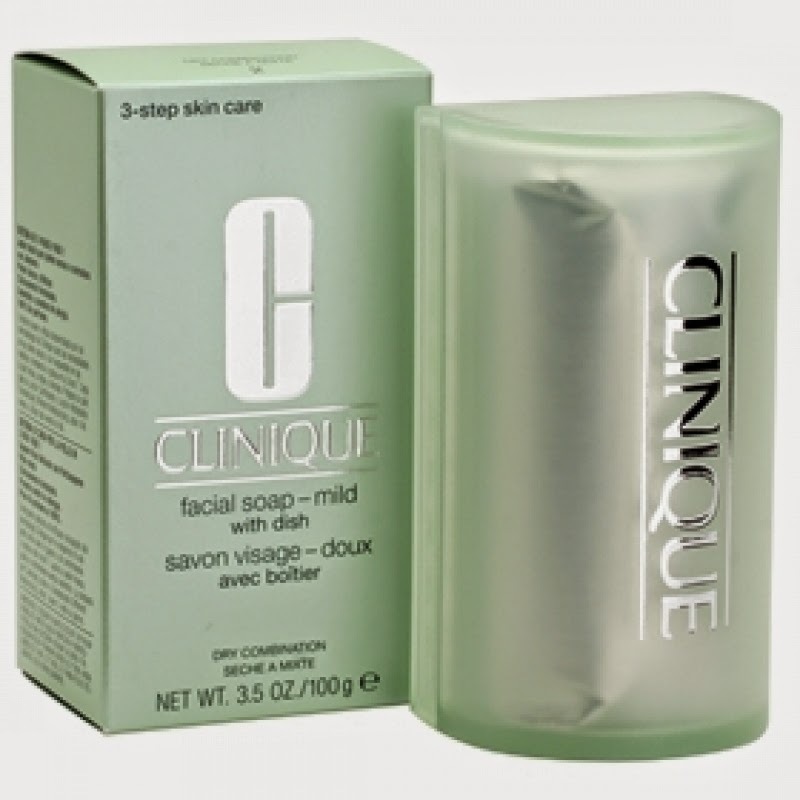 It rinses away easily and prepares skin perfectly for the exfoliating action of Clarifying Lotion. This hand-milled, long-lasting soap is comes with a convenient dish, perfect for home use or travel. I had received a small sample of the Clinique Facial Soap when I ordered a few other things from Sephora. I love that they give out samples with every order!! Anywho! I loved it! The sample bar I got was about the thickness of my thumb and about as long as my pinky. But it lasted me, it seemed like, forever. I love how it made my face feel clean yet it wasn't dry. My face was soft and glowing! When my sample bar was about to run out I immediately ordered a full size bar. When someone finds something good lol you do not want to run out! The price on this facial soap is perfect. It's $14, BUT it will last an eternity! Compared to other soaps you pay $5 for only lasts about 3-4 weeks. The Clinique Facial soap sample that I had, which is a quarter of the full size lasted me over a month!!!! So the full sized bar, I would assume, will last me at least six months! That is using it daily! Amazing I know!! I love how this soap comes with its own dish for easy storage! It fits perfectly on my sink and doesn't get in the way. It cleans my face thoroughly and leaves it fresh and soft! I suffer from mild acne and this soap definitely keeps it at bay! 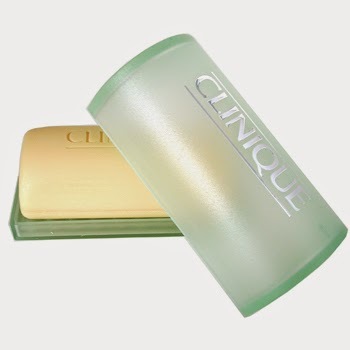 There are also other Clinique products available that would go great with this facial soap but that will have to be something to write about in another post! If you are looking for something that wont dry out your skin but leaves it feeling fresh and clean then this is the product for you! It lasts a long time so the price, I feel is worth it! 1. We set the highest quality standards! 2. Made of Quality Materials such as the Heat Resistant Wire and Stainless Steel = Durability At Its FINEST! 3. You will be able to serve the PERFECT TASTE at all times. 4. Sends out an alarm when the target temperature is reached, this gives you more time to prepare other things! 5. 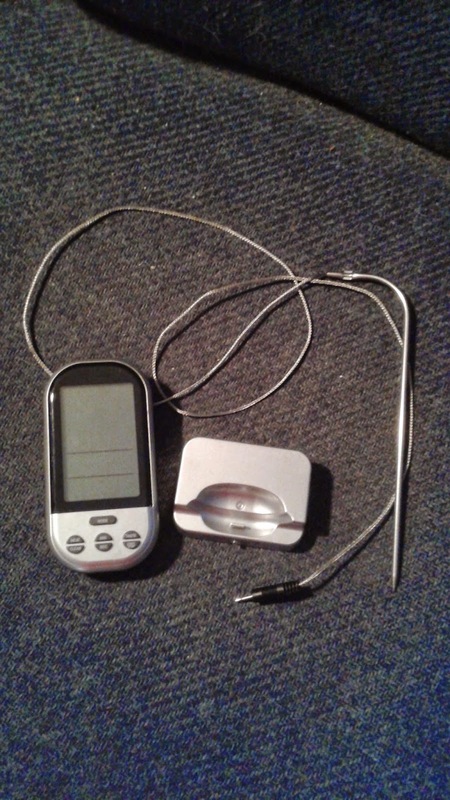 Cooking with a meat thermometer like ThermoFuture saves you a lot of hassles in checking the meat from time to time. I have to say I was a bit perplexed with this device when I first received it. It didn't come with any instruction manual so I had to, with the help of my husband, figure it out on my own. Once we got the hang of it and got all the settings right, it was a breeze to use! We had originally wanted to cook deer with it first but decided to cook a pork loin instead. The display lit up pretty bright and was easy to read. 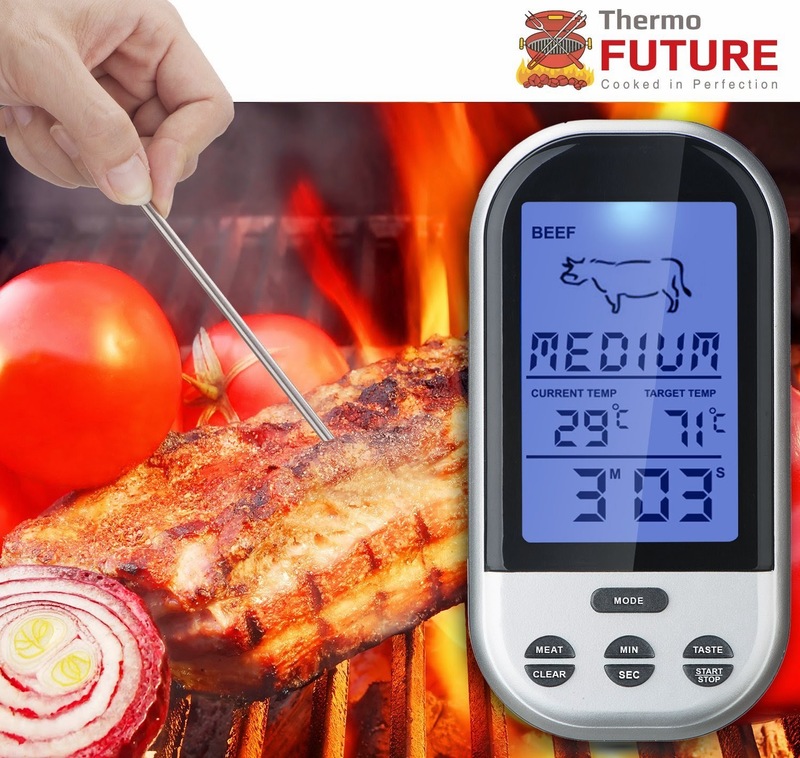 It shows temperatures for Beef, Lamb, Veal, hamburger, pork, Turkey, Chicken and Fish. I like how it has a base for easy stand up. It takes 4 AAA batteries that are not included with the thermometer. Two for the base and two for the thermometer. However I didn't like the probe line very much. It wasn't all that easy to store and seemed a little bulky. It wasn't long enough to stand away from the oven so we had to pull the food out to test it. It has a timer on it and was loud enough to hear from across the room. All in all, I would recommend this for those who do a lot of cooking with meat. At a price of around $50 it's a bit pricey for those who wouldn't use it a lot. 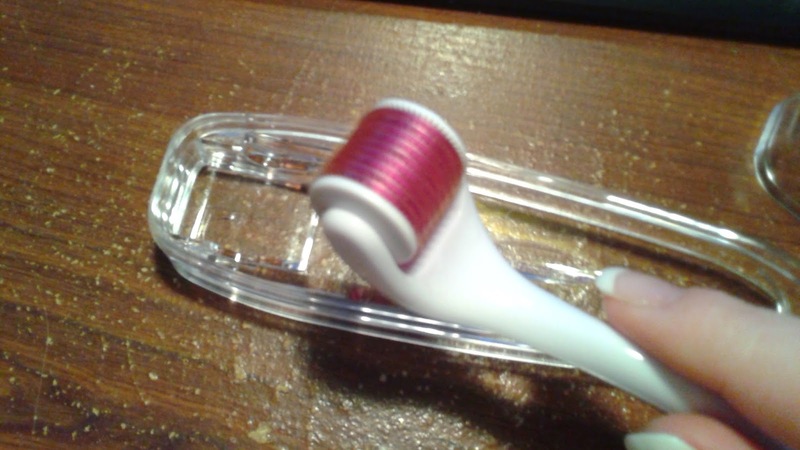 I got the great opportunity to try a wonderful product from the Ozeri brand! The Fresko Duo Salt And Pepper Grinder is a sophisticated tool that everyone should have in their kitchen! 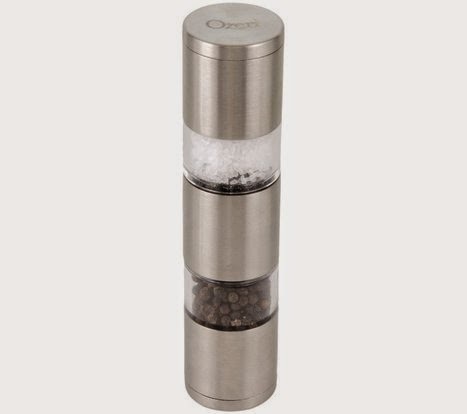 The Ozeri Fresko Duo Salt and Pepper Grinder is designed in Germany and handcrafted using the highest quality stainless steel. Boasting a space-saving design that combines BPA-free salt and pepper chambers in one grinder, the Fresko Duo offers a chic form factor that both looks good on the dining table and store easily. The Fresko Duo utilizes powerful earth-friendly ceramic gears capable of grinding peppercorns, salt, and spices. The Fresko Duo also features two adjustable knobs for grain adjustment from fine to coarse, and a transparent container that both reveals the grinding action and makes monitoring seasoning levels easy. I was in love with this product as soon as I opened the package! It's got a sleek design and doesn't take up a lot of room on the counter or table. A must have for every kitchen! It was very easy to use and took no time to fill up the compartments! 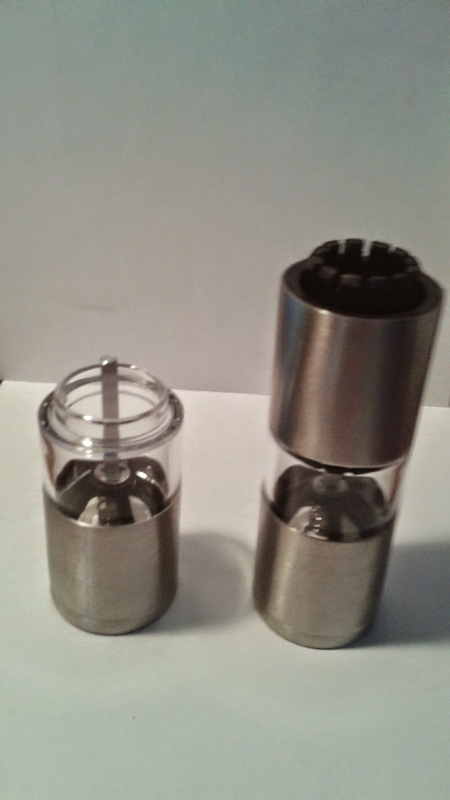 The top lids pop off for the salt and pepper to come out and goes right back on to keep your spices fresh! To fill it, all you have to do is pull the two ends apart and fill. Then pop it back together! I love to have freshly ground salt and pepper and I feel that this product gives me exactly what I need and a look that is perfect! I recommend it to others if you are looking for a simple, eye catching piece to add to your kitchen! 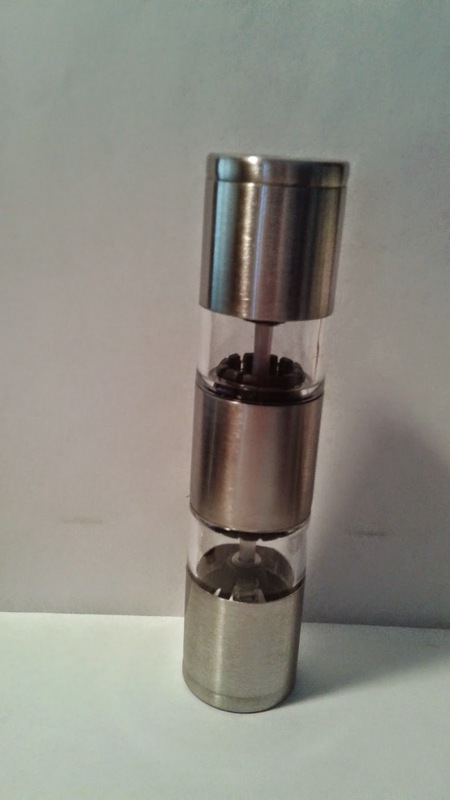 It works great and doesn't stick like other grinders I have used. 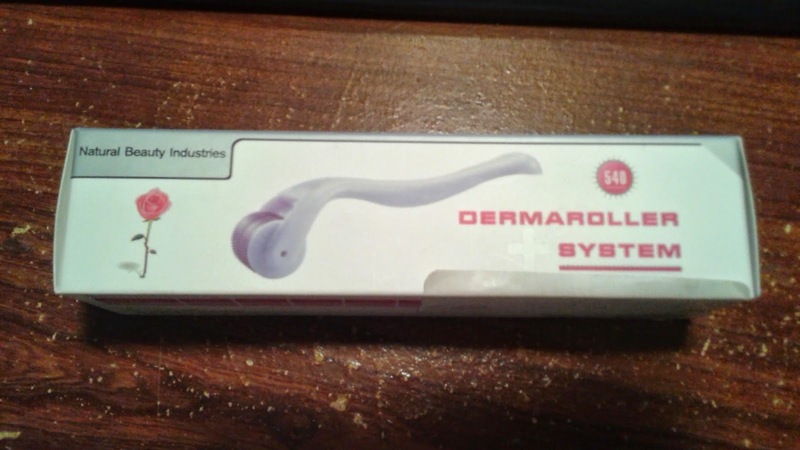 I recently got the chance to try the Dermaroller System 1.0 mm. I was a bit intimidated by it at first and had absolutely no idea how to use it. So I clicked on You tube and watched a few tutorials. It looks simple enough! 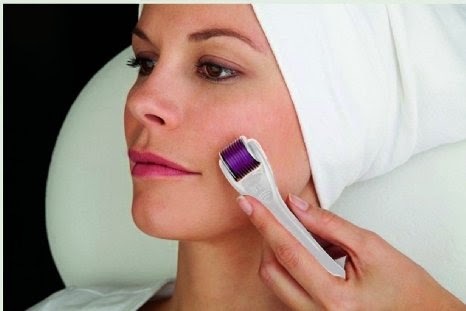 It shows that this system rolls across your skin to stimulate blood vessels to send signals to repair the area that you are concerned about. My Dermaroller came in a small box which shows the product on the outside as well as how to clean it and how to prepare skin before use. Inside the box the Dermaroller was inside a plastic case which was also surrounded by a surgical type packaging to keep it sterile. I really like the fact that the company takes that extra care to make sure it is safe and clean before use! When I tried it I really thought that it would hurt so I lightly rolled it across my face. I was surprised to see that it didn't hurt like I thought it would. I used it exactly the way it shows. My skin became red, due to the fact that my blood vessels were being stimulated. When I was finished, I put on a little vitamin C serum on my face just to give it a little extra protection. Then cleaned it as the instructions told me to. I have only used it for a few days so I am unable to see a difference. But have heard really good things about the product so I will continue to use and see what happens! I can't wait to see if it helps repair some of the damage I have done to my face! I also plan to use this on my stretch marks as well! 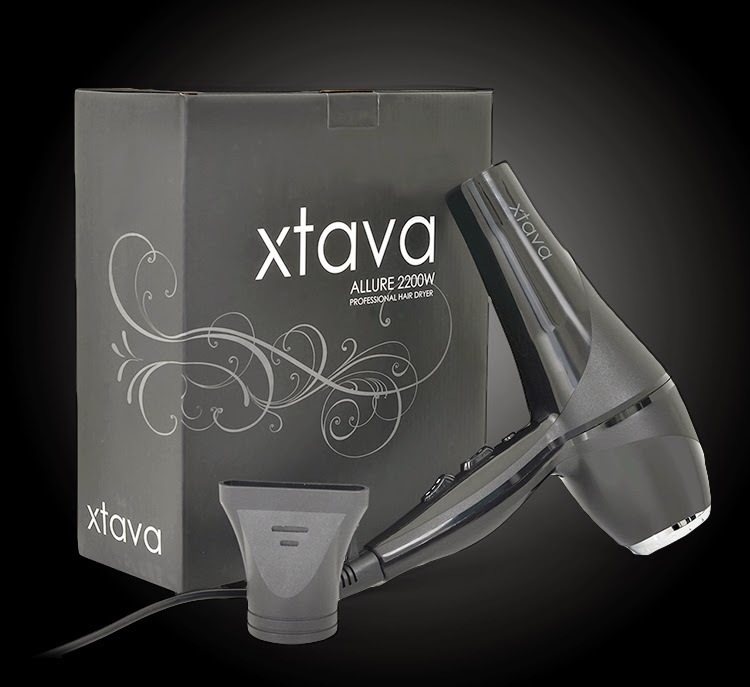 ULTRA LIGHTWEIGHT 2200 WATTS - STYLE WITH EASE: The Allure Dryer combines an ultra-powerful 2200 W motor with a lightweight frame to create the perfect styling tool. Looking good is almost effortless with the included Concentrator Nozzle. This attachment directs maximized condensed air flow to the area you are targeting, adding precision and focus while controling frizz and style outcome. I personally have not used a hair dryer in years due to the fact that I color treat my hair and tend to get split ends easily. Using a hair dryer just tends to make it worse and full of frizz. But with the recent cold snap we have been experiencing on the East coast, I felt that using a hair dryer would be best. Going outside with damp hair only makes for easier breakage as well as a higher chance at getting sick. 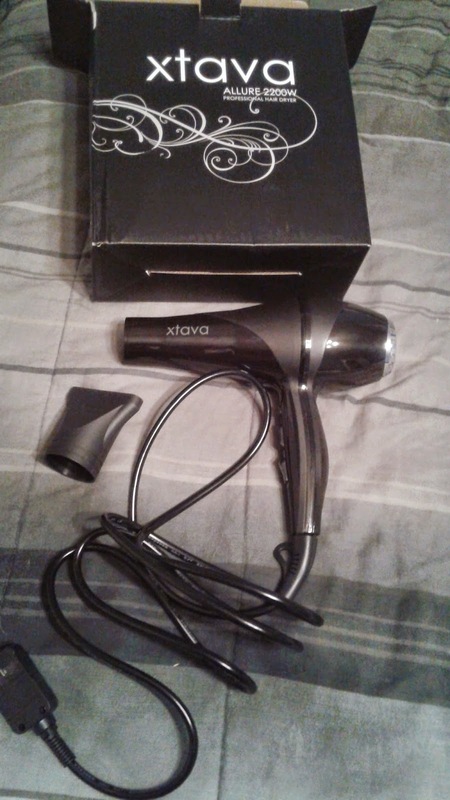 So when I got the opportunity to try the Xtava hair dryer, I took full advantage of it! The pros were definitely outweighing the cons! 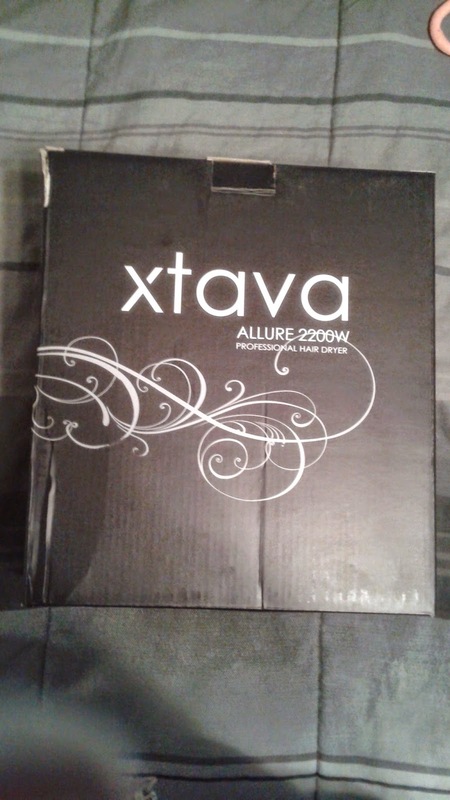 The hair dryer came in a very nice sturdy box and wasn't overly decorated. I really liked the package because it didn't seem to busy with pictures of what I would be able to look at when I opened the box. Very basic and sleek! The hair dryer it'self was a normal size I would expect for one and had an attachment for easier air control included. The cord wasn't all twisted and looked very nice! I actually read the direction on how to use the hair dryer because it had been so long. I pretty much knew what to do but wanted to make doubly sure I didn't mess it up in some way! I'm weird like that!! So I took my shower and towel dried my hair just enough that it wasn't dripping all over the place, plugged in the hair dryer added the control attachment and turned it on! I was impressed that it wasn't as loud as I thought it would be. It was actually pretty quiet! With the air control I was able to dry my hair in about 3 minutes! The hair dryer has different settings on it and are very easy to read. One button controls the speed and the other for heat. Very simple. However, because of the treatment of my hair it did leave it frizzy. So I went out and purchased a hair product that was compatible with the heat of a blow dryer and I haven't had an issue with it since then. 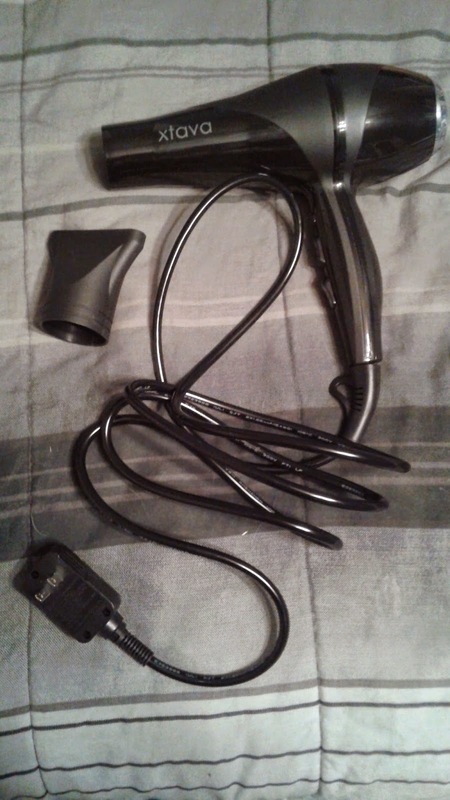 I love the hair dryer and would recommend it for anyone! I think the company has it's customers needs in mind and would make a great replacement for your current hair dryer! Although, if you tend to have frizzy hair like me, I recommend you get a heat treat for your hair and add it into your routine. And i'm sure this would be the case with any type of blow dryer on the market. A thrilling novel spiced with erotica that represents the story of Dalia Raz, a successful ceramics artist who suddenly becomes a widow after her husband is killed by a mysteries explosion in the factory he worked in. In her despair, she decides to change and rehabilitate her life from her disaster. She turns her life upside down and opens a business for day use renting rooms by the hour for intimacy purposes. In parallel, she begins searching for the truth regarding her husband’s death and a series of explosions in secret military facilities. She refuses to believe that the series of explosions is random, but discovers nothing. Her new fascinating life exposes the reader to amusing and even occasionally frightening stories. The book also sheds light on Israel’s nuclear secrets. The ending is surprising and unpredictable. The story is based on real life events; although names have been changed to avoid privacy invasion. Dalia loses her husband in a tragic accident at his place of employment. Dalia is devastated but tries to get her life back on track, for her and for her children. She throws herself into sculpting but finds it unsatisfactory. A long time friend introduces her to the business of day use rooms, rented out by the hour for lovers to use as a getaway from everyday life. Later, she writes a book about all the exciting stories that she has encountered with the day use rooms that she rents out. She aides police in a few cases and receives an award for her efforts! She runs into some interesting turn of events and that is where this book really gets interesting! In reading this book i was pleasantly surprised at the way it ended! It was full of twists and turns throughout every page. It was full of funny encounters as well as a few heart racing events. It was one of those books that you just didn't want to put down because you would be afraid of missing something! I really enjoyed the fact that it was about a woman who picked herself up from despair and made a great turn around into a very successful independent woman. She shows great strength throughout the entire book and in the end has a great surprise and revelation all at the same time! The end was bitter sweet! I recommend this read to anyone who is looking for something that has a combination of tragedy, humor and suspense all rolled into one! I felt it was a great read and will definitely read it again! Anyway! During the week I had cheated and weighed myself at home and had lost 2 pounds. Now the weather here in Virginia has been extremely cold and snowing. So I was unable to take my walks outside like I normally do. I did do some inside workouts, but just wasn't feeling it this week. No, I have not given up lol I'm sure everyone has those blah feeling days! I was able to lose a pound this week! Not the 2 I had originally lost during the week but it was still something! My thoughts today: even when you have those blah days and you don't feel like doing anything, don't give up. Keep going for your goal no matter what. 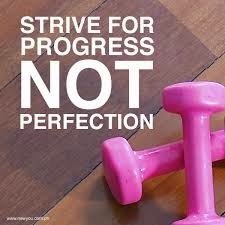 Don't get discouraged when one week you don't do as good as the last. It WILL happen if you keep on truckin! I have much love for those who are taking this journey with me! Just remember it will not happen overnight, but if you work hard, it will happen! This fun children's picture book is about a boy with red hair and freckles named Terry, yet everybody calls him Terry Treetop because he loves climbing trees. Terry is chasing a beautiful butterfly and wants to go back home. But where is Terry's home? And how can he find his way home? Does the rabbit in the borrow know? Does the beaver in the lodge know? Maybe the fawn's mother knows? Or can Susanne the squirrel help him? Do your kids love to listen to stories about the habitat and environment of different kinds of animals? Do your children like beautiful picture books? Where is my home? is a sweet children's book written especially for you and your aged 3- 8 children with 18 colorful illustrations. The story is suitable as a read aloud book for preschoolers or a self-read book for beginner readers. Terry Treetop chases a beautiful butterfly and gets himself lost. With the help of some new friends he tries desperately to get home! 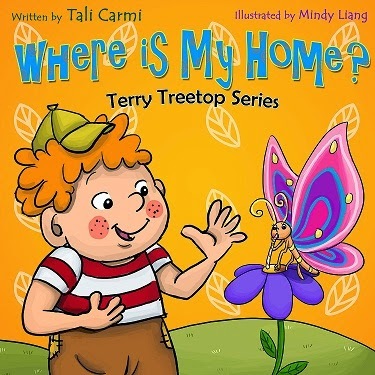 Will Terry Treetop be able to find his way home? Find out in this great illustrated book by Tali Carmi! This is another great read for the little ones! The illustrations are very bright and eye catching. I feel it will teach your child not to run off without an adult, the great aspect of teamwork! I also liked that the author offers a free gift with the purchase! A fun game for the entire family to enjoy together! I recommend this read for your little beginners and as a great story to share together. Best Selling children author Tali Carmi Does it Again! Want your kids to care about the environment? This is the fourth book in the Terry Treetop best sellers series. In this book Terry Treetop went camping with his parents to a marine nature reserve. He saw a cheerful group of dolphins and wanted to play with the little dolphin, but something went wrong and the little dolphin was in danger. This beginner reader’s eBook will teach your child about marine mammals and their habitats, and will inspire your kids to be aware of the environment and the responsibility of humans towards animals in their care. Your kids will enjoy full-color illustrations of Terry and the dolphins group. 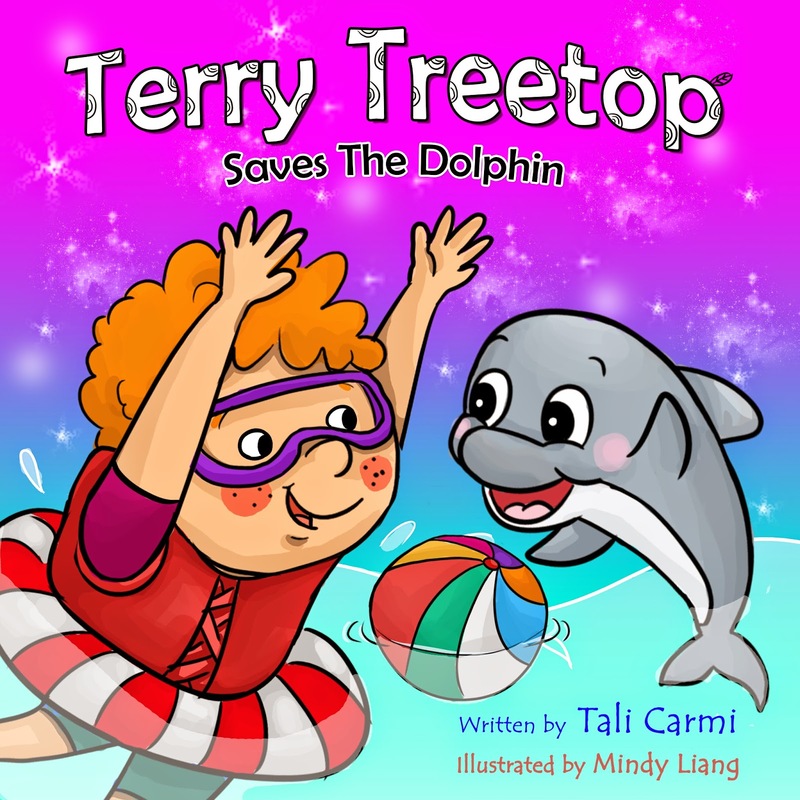 Terry Treetop Saves The Dolphin is a sweet children's book written especially for you and your kids ages 2- 8. With simple text and 16 colorful illustrations. In this great children's book Terry Treetop gets to go camping with his family! While there, he uses his binoculars to look at all the pretty landscape around him. He discovers some Dolphins playing in the water! With curiosity, he went to go find out about the Dolphins. Something happens and one of the Dolphins needed some help! Will Terry Treetop be able to save this little guy? Find out when you read the book! I love that this book is illustrated with colorful pictures. I believe that it will keep your little reader fully engaged! It teaches curiosity, responsibility, the willingness to help others and the awareness to ask for help when needed. This is a great read for beginner readers and a good bedtime story! I think it will get the imagination growing! I recommend this book to anyone with small children! 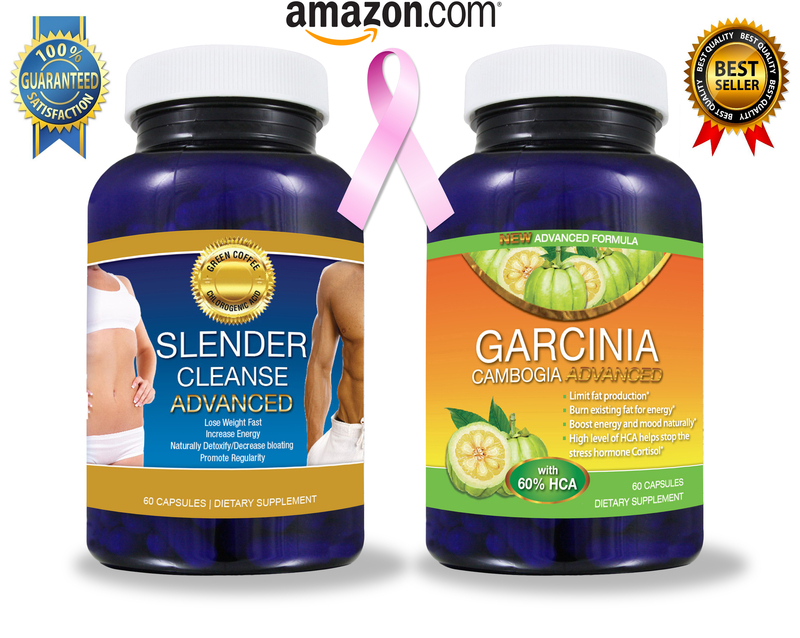 WHAT IS GARCINIA CAMBOGIA ADVANCED AND SLENDER CLEANSE ADVANCED? 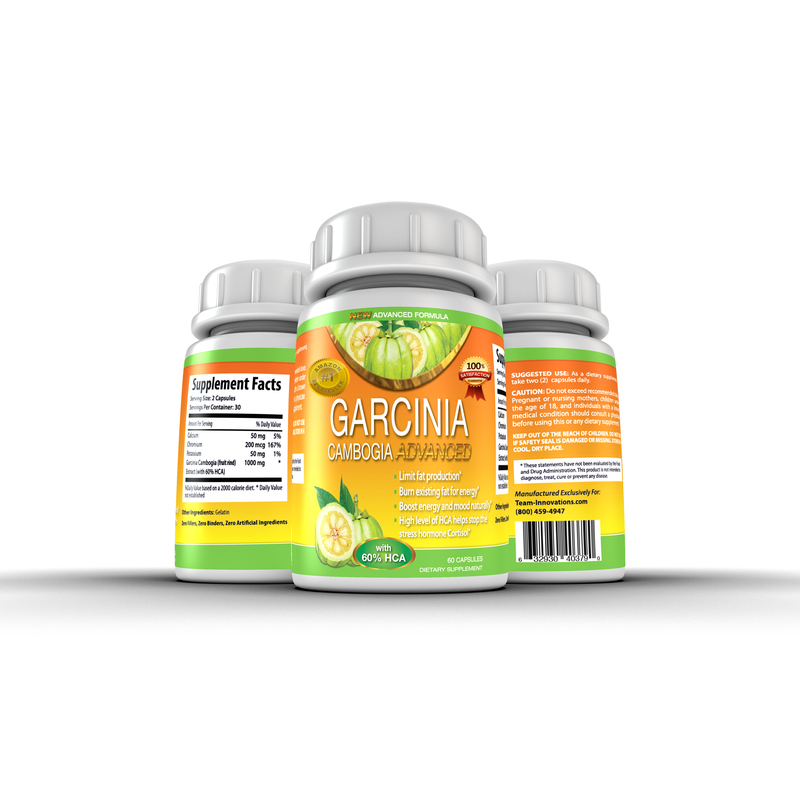 Weight Loss and Fat Burning has Never Been Easier with the Garcinia Cambogia Advanced and Slender Cleanse Advanced Fat Loss System! LOSE THAT FAT!!! The ULTIMATE FAT LOSS SYSTEM! -Where did the Fruit come from? -Is the extract 100% pure? -Does it have the right dose per serving? -Does it contain atleast 60% HCA? Garcinia Cambogia Advanced was developed with the TV doctor's strict criteria for theproper Garcinia Supplement. Here's his recommendation, which is seen on his website... The good TV doctor recommends taking 800mg twice a day, 30 minutes before meals (That's 1600mg a day total). ...He recommends that the product be 100% pure, have absolutely no fillers, no binders, no artificial ingredients and in a pure vegetarian capsule. And most importantly they must contain at least 60% HCA, which is the key to weight loss. GLUTEN-FREE and Made in the USA in a State of the Art GMP facility. 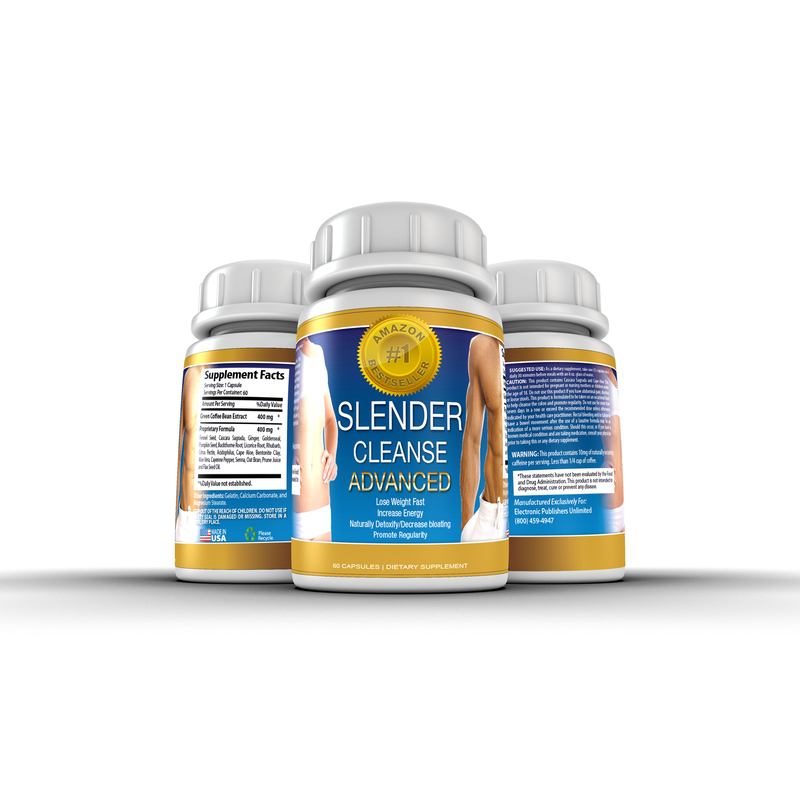 Slender Cleanse Advanced is a 7 day all natural gentle and controllable method to break up and flush away POUNDS of unwanted toxins and build up from the walls of your colon and intestines. --> SKINNY JEANS HERE YOU COME! WHY YOU NEED TO ENSURE YOU USE GARCINIA CAMBOGIA ADVANCED AND SLENDER CLEANSE? 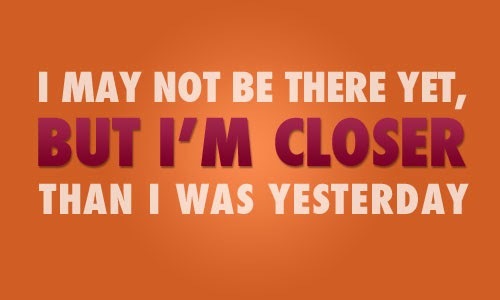 It's Time to Cleanse Your way to a NEW YOU with Slender Cleanse and Garcinia Cambogia Advanced! When I received this product, I really wasn't sure what to expect. I am currently in the process of losing weight, so I have high hopes for this duo! The packaging was great. Both bottles were sealed and not expired. I always look for that when I have ordered online. I started taking them just a few days ago but I can already tell a difference in the way my body is working. My digestive system seems to be getting on a regular schedule with the Slender Cleanse. I don't feel as if I am as bloated as I use to be! I weighed in on the 13th of February and was 162. 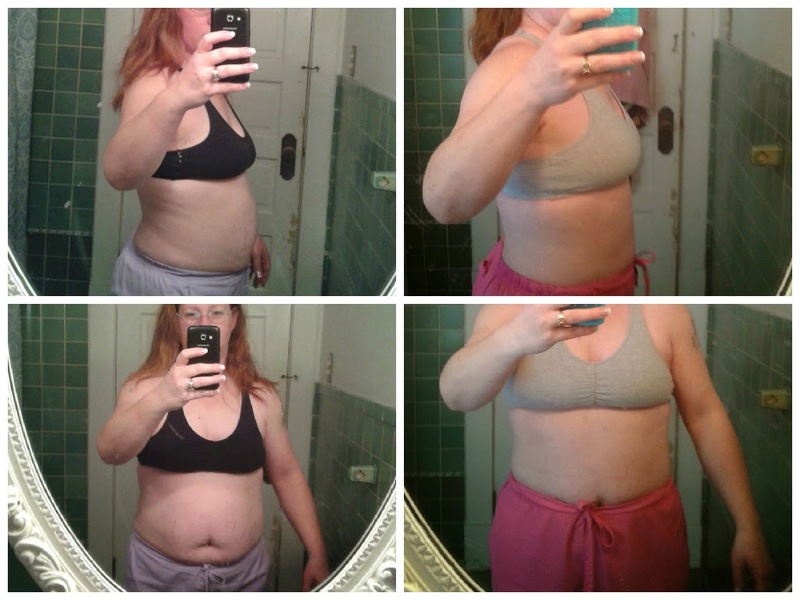 Just 4 days after taking these products I have lost 2 pounds! If that isn't results I don't know what is! I am extremely impressed with the results so far with the Slender Cleanse and Garcinia Cambogia Advanced! I think together they make a great pair and aid in my weight loss journey! I can't wait for the long term results of these products! I recommend them to ANYONE trying to lose weight. I can't promise that you will have the exact same results as I have had but it IS working for me!! In combining these products into my daily routine and workout, I have already seen great results and I hope that it can help others as well with their weight loss goals! Remember, when trying new supplements, that it's best to consult with your doctor before taking anything. 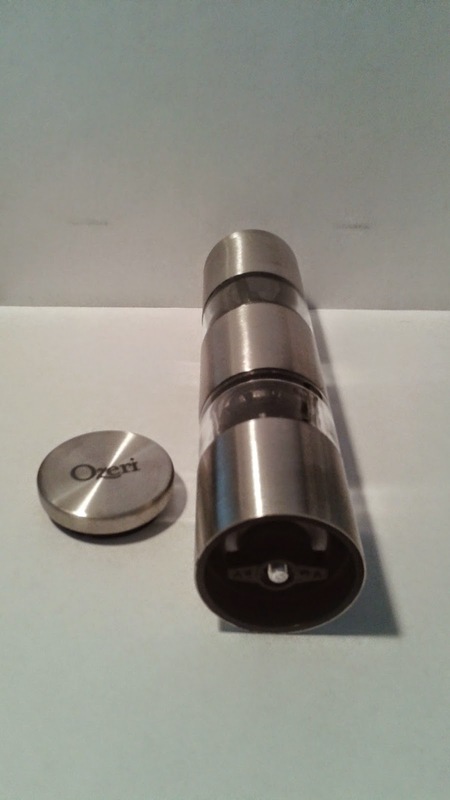 * Easy to install - simple attach LED wheel flash light to valve stem on bike. Fits almost all bikes. * Speed Racer is rust resistant, 1100% waterproof and usable through any terrain. When I received these, I was a little confused at how they worked. But with the help of my husband, we quickly placed them on my sons bike tires and tested them out! They light up with just a little vibration and are very bright! I was pleased at how well they worked! It easily installs on the valve cap and is secure so you don't have to worry about it falling off when riding your bike! Even in the daylight you can see how bright it is! I love how they change colors as you ride! It's not the same ole same ole while riding down the street! That aspect, I think makes it even more fun! They are very durable and have lasted a long time, considering that my son rides his bike everywhere! They have been on his bike for ever a week now and with as much is he has ridden his bike they are still as bright as the day I received them! The lights are a fun way to decorate your bike up and a great way to be detected at night while riding on the street. In our area it is mandatory to have some type of device on your bike so that cars can see you. So this was perfect! I truly recommend the LED lights for any bicycle! They are a fun and festive way to primp up your tires! I know my son and I are enjoying them fully! Is Humanity Ready for the Passage into the Golden Age? The Knowledge of the Gods describes the spiritual growth of a woman who managed to awaken as a result of the hardships she experienced in her life. Because of her experiences, she decided to make a sacrifice ”" to sacrifice herself for the benefit of the people around her as well as for the benefit of humanity. Her willingness to make the sacrifice came from her aspiration to see all the people of the world live in peace, love and harmony. Because of her belief that sacrifice can assist in the fulfillment of her aspirations, she turned to God and asked him to accept her sacrifice. She asked to give up her life for the benefit of others. Not long after that, the author of this book developed the ability to conduct channeling. Gradually, the level of her spiritual guides rose, according to the level of knowledge and spiritual awareness she accumulated. Her continued sacrifice and progression in knowledge caused the angels and higher gods to connect with her. The high gods of light began to offer her their knowledge. They wanted to assist her in achieving her spiritual destiny. Through her, they wished to pass on their knowledge and science. The gods asked her to write a book and through that book, to offer their knowledge to all the people of Earth. With the aid of channeling, a connection was established with the gods of light from the Egyptian era, especially with the Gods Amun-Ra and Michael, who reached the spiritual level of the creator; thanks to their knowledge. In this book, a woman takes a journey in life through meditation and channeling. She finds that she is very special in many aspects. She somehow can talk to Angels as well as other "alien" beings through her meditation sessions. Through her life she learns many valuable lessons. What the light and dark spirits are and how to avoid the ones she shouldn't associate with. She is given many gifts and shares it with those around her. Now my personal belief does not believe that somehow we can achieve such greatness by talking to "gods", because I truly believe that there is only one God. That being said, here is my review for the book. It is a great book. The story being told is a good one but was very hard to follow for me. This woman learns that lying is not good for the soul and being hateful just leads to shame. It tells that being honest and straight forward is the key to love and happiness. 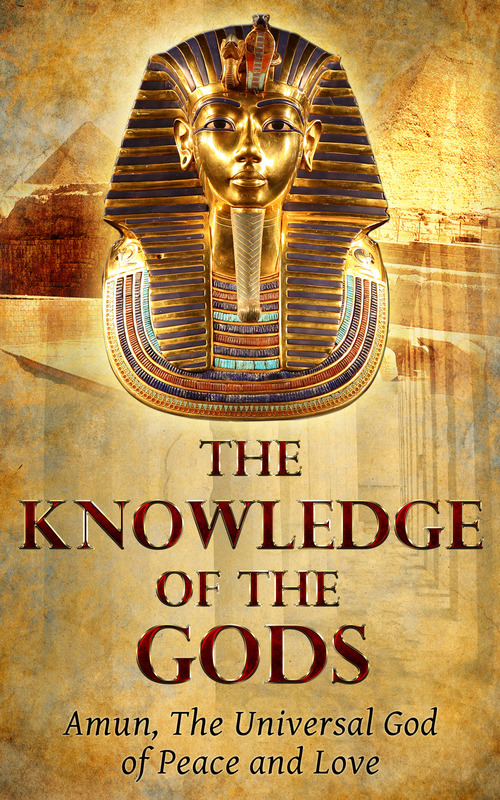 Making a journey with the "god" Amun, she learns many different aspects of the universe. What is yet to come and how to channel the good light from the darkness. She makes a journey to many different planets and meets many different "aliens" who teach her how to make changes in life for the good of everyone. To me, the woman telling her story, has deemed herself as worthy as a god. Healing people and changing life's course for many around her. There ARE many good points to this book. I feel it teaches people how to love unconditionally and how to live a better, stress free life. However, if you have different beliefs, it's hard to follow. I didn't agree with the whole "talking with the gods" aspect. I try to stay open to learning new things and making changes in my life for the better. I just don't think this is my cup of tea. I would recommend this read. Just know that it is not a typical religious book. I personally will read it again, only for the fact that I find it interesting and i'm sure will learn something new while reading it a second time. I like to analyze the facts with what others see as true and real.